A touch of brown sugar boosts the sweetness of a mashed ripened banana in this creamy, nutty dip that's perfect with sliced fruit. Mash banana in medium bowl. Add cream cheese; beat with wire whisk until well blended. Add pecans, orange juice and brown sugar; mix well. Choose the best fruit picks in the supermarket for dipping. Serve with crackers instead of fruit. Dip can be prepared ahead of time. Store in tightly covered container in refrigerator up to 4 hours. Makes 6 servings, 2 Tbsp. 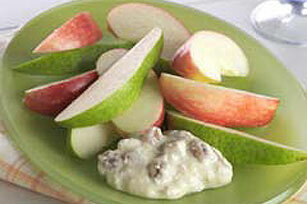 dip and 1/2 apple and 1/2 pear each.